Eton Mess with Homemade Meringues! A Classic Summer Dessert with homemade Meringues – Utterly Scrumptious! If you haven’t heard of Eton mess you are 100% missing out on the greatness of such simple yet delicious dessert. Meringue, Cream & Strawberries mashed together make a creamy, sugary and fruity mess that is so addictive you will want to make it again and again! You can of course use shop bought meringues as they’re so cheap these days, but I love making my own as they are so simple! I add a touch of Raspberry Coulis to my Eton Mess because I like the twist on the two fruity flavours, and it elevates the dessert even more. Seriously though, this dessert is a marriage made in heaven, and I LOVE it. I love to experiment with Meringues, but todays recipe is just the basic Meringue – many of you have asked for it, and it really is simple, and like the others on the internet – but nevertheless here is my recipe for them, and my Eton mess! 1) To Make the Meringues – Preheat the oven to 100C/90°C Fan and line two Baking Trays with Parchment Paper! 2) Separate the eggs into a spotlessly clean bowl (stand mixer bowl) and discard the yolks – or use them to make something else!! – but be careful not to get anything else in the egg whites such as a spot of yolk as this will ruin the meringue! 3) Whisk the Egg Whites on their own until soft peaks are form – it’ll double/triple in volume and look foamy and white, nothing like the normal egg white! Continue whisking the eggs on a Medium-High Speed and add the Caster Sugar a teaspoon at a time making sure its whisked in before you add the next spoonful. I realise this is time consuming, but adding the sugar any quicker will ruin it! 5) Pipe the Meringues onto the baking sheets – I use a Wilton 1M tip to make my little Meringue shells – aren’t they cute! Bake in the oven for 1 & 1/2 hours and then turn the oven off. Leave the Meringues to cool off completely in the oven till the oven is cold! This is very important that you leave them to cool off completely as if you take them out any sooner they will taste amazing, but they won’t crush down and they’d have the Chewy Meringue feel you can get sometimes! 6) Whip the cream up with a whisk until soft peaks and it holds itself, fold through to Coulis (I used Raspberry Flavour) – wash & chop the strawberries up – and crush the meringues. Fold it all together and either serve in one large dish, or in small Jars for individual portions! This is best served on the day it is made – if not, store in the fridge until wanted! You can use other fruits or coulis in flavours that you like, but I love the classical Strawberry combination! You can find my other Dessert Recipes on my Recipes Page! Older Next post: Strawberry Hazelnut Chocolate Tart! Newer Previous post: No-Bake Oreo Cheesecake! What do you mean by regular cream? Like fresh cream that you would whip yourself and add to desserts. Just less fat than double/heavy cream I think! I’m from the UK, and we have ‘double cream’. It’s the fattiest liquid cream we have so I think heavy cream is your nearest similar one? All of your sweet desserts looks so good in your pictures, especially this one. I love your presentation re: Eton Mess. I’ve just started making meringue (I know, so easy but I always thought they sounded daunting), and am having friends round for a meal. Your presentation has given me inspiration – so has the rest of your site! My husband is not a dessert eater but he loves Eton Mess which means I often make it. Eton mess is definitely a winner! Oh wow, I now have an insane craving for Eton mess! These look amazing – I know what I will be whipping up for dessert this week! Quick question, have you ever used cream of tartar in your meringues? I have a lot of strawberries to use. Eton Mess is so good, it’s been a while since I’ve had it. I think this will be dessert this week. 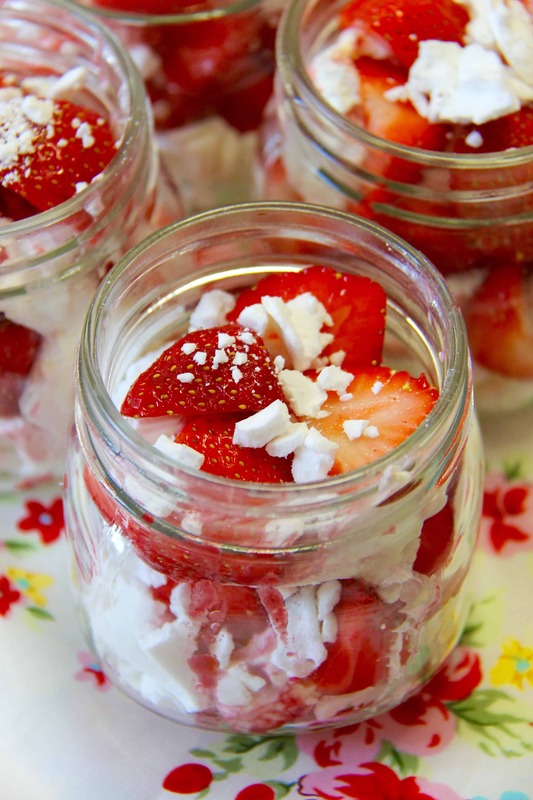 Love a good Eton Mess – must try this one!